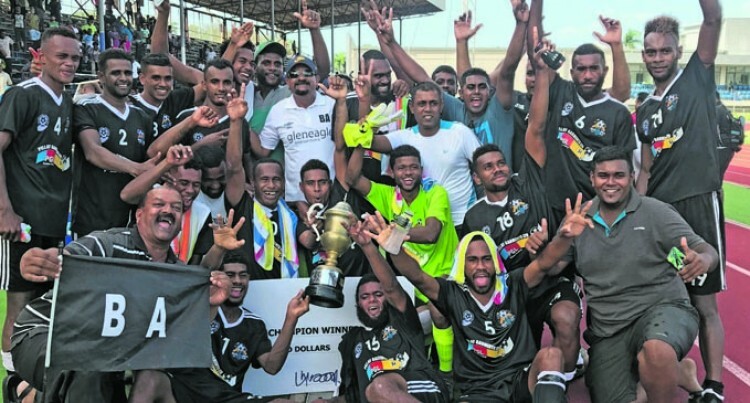 Ba’s triumph over Lautoka in the Pillay Garments Champion versus Cham­pion series could not have come at a better time for the club. Fans had begun to lose confidence in the team after a dismal showing in the Inter-Dis­trict Championship – marked by confusing coaching appointments and strange match tactics. There was genuine concern Ba would sim­ply go to make the numbers at February’s OFC Champions League, a competition they nearly won in 2007. But Ronil Kumar’s Ba surprised everybody at the CVC, claiming victory over two match­es against, arguably, the best side in the coun­try at the moment. In doing so, Ba has built crucial momentum going in to next season and ahead of Ocean­ia’s top competition. The manner in which Ba won the two match­es (0-1, 2-1) was also impressive. The club’s reputation has been built on a history of daring, possession-based attacking football coupled with a strong emphasis on young talent. Those characteristics were present in Ba’s game, as Kumar overhauled the entire IDC squad, retaining only Avinesh Suwamy, Malakai Tiwa and Abbu Zahid as his senior-most players. It was a massive shift in selection policy, no doubt inspired by the recent success of Yala­levu and Nailaga at the National Club Cham­pionship. Kumar, who is a relatively inexperienced coach with just a single trophy under his belt, will find it easier working with younger play­ers. It will be a surprise if he changes his phi­losophy after this result. Unknown Solomon Islander Darold Kakasi gave Ba something their strikers have strug­gled with in recent years – finishing impor­tant chances at crucial moments of the game. Kakasi scored the winning goal for Ba in the first leg, and also the equaliser in the second just as Lautoka had begun to swing the series. Where the 19-year-old lacked in height and strength of a player like Saula Waqa, he more than made up for with his close control and quick feet. Opponents will have noticed Kakasi’s style by now and it’s hard to predict whether he will perform when defenders are paying clos­er attention to him. For now, he is very much central to Ba’s new­ly-found attacking style and the team will be thankful for it. For Kamal Swamy’s Lautoka, the loss could be a blessing in disguise – as the Westerners also have one eye on the Champions League. Swamy said he had no excuses for the loss, only to blame a long season and fatigue as reasons for losing a competition Lautoka have not won since 2010. In truth, Lautoka could have easily won the series had they converted their chances. Although he might not publicly admit it, Samuela Drudru’s poor finishing is still caus­ing headaches for Swamy in attack. While the striker did get one goal in the second leg, he missed numerous opportuni­ties the likes of Jone Vono Junior or Valerio Nawatu, at their peak, had no problems con­verting. As good as the Sugar City boys have looked this season, this loss was a reminder how dangerous playing in second gear can be.